People have a habit of comparing themselves. To other people, to animals, to fictional characters, and even, yes, coffee. 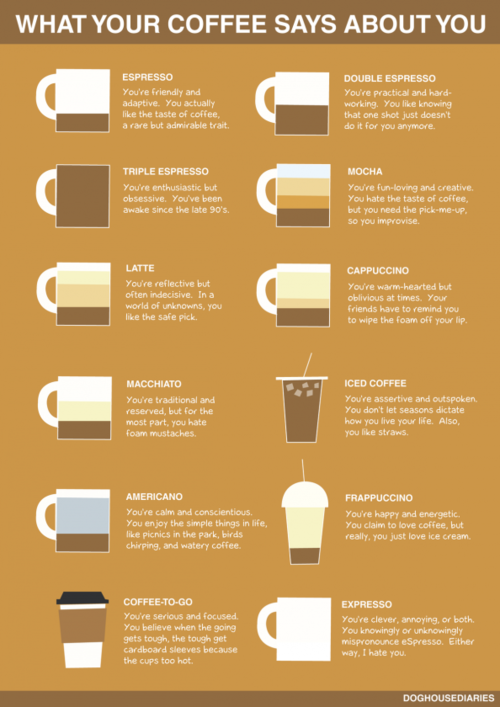 Thanks to the infographic below, you can now see what your preferred method of ingesting coffee says about you. Of course, at GreenStreet, we can make almost any of these drinks, but we don’t think that our complex customers can quite be summed up with such a limited selection. Instead, we want to know what YOU think each of our amazing single-origin roasts says about its consumer. We’ve provided a couple of suggestions, but we want to hear YOUR thoughts. You’re pretty down to earth, with realistic expectations about most of your life. You tend to be an optimist though, and always see the silver lining, even if everyone around you is covered in clouds. Summer is your season. You love being outside all day, feeling the sun beat down on your face as you picnic in the park, letting time just melt away. Are you coffee, or are you tea? Ambiguity is such a part of your personality that some people think you’re too much of an enigma to figure out, but we know you’re really just incredibly intriguing. You are a very hopeful and positive person. You are the silver lining, always bringing a smile to people’s faces with your cheery disposition and beautiful smile. Your favorite time of the year is Thanksgiving. You love being safe and warm at home, as well as the crisp feeling of autumn air. You like to be the center of attention, without ever encouraging such attention yourself. The focus placed on you is understated and elegant, even though you’re trying pretty hard to pull it off. Smooth and Rich, with smoked chocolate. Go big or go home is your motto. You like to make a dramatic entrance wherever you go, and appreciate the finer things in life, because they help you make excellent exits as well. What do you YOU think? Did we get it right, or would you say you’re not cheery just because you love the Chiapas, or you’re actually pretty grounded despite adoring our Espresso blend? And what does it say about you if you like lattes made with Nicaraguan Santa Teresa, or our coldbrew, but only if it’s made with Ethiopian Kellensoo? Tell us your thoughts here, or our twitter, facebook, or shoot us an email at greenstreetroasters@gmail.com!